However you pronounce it, they really are simple to make, SUPER delicious, and rest assured you’ll be getting your helping of fresh veggies for the day! After all …. it’s mostly a Greek Veggie Salad Sandwich anyway, just drizzled with that hard to pronounce cucumber sauce that is totally easy to make in your blender. All I had to do was figure out how to replace the meat – and these smokey Portable Mushrooms I come up with do the job nicely. I guarantee when all those ingredients come together to party… it’s gonna make one TASTY sandwich. For my version, I used a 12oz block of Extra Firm Tofu. If you’re allergic to Tofu – there may be Cashew based versions on the web, but that adds a lot of fat – so your choice. Make sure you pat the Tofu dry and then cube it up for your blender. Now we simply add 3 Tbs Lemon Juice, 1 Tbs Apple Cider Vinegar, 2 cloves Garlic, 1 peeled English Cucumber, a heaping Tablespoon of fresh Dill, and ½ tsp Salt. Blend until smooth stopping to scrape down the sides if necessary. You may like more Lemon Juice or Dill – so adjust as necessary. Store this in the fridge until we’re ready for it later. I used two 8oz Packages of pre-sliced Portabello Mushrooms. Arrange these as best you can in a large skillet. In a small measuring cup, add ¼ cup Low Sodium Soy Sauce, 2 Tbs Maple Syrup, 2 Tbs Water, 1 tsp Oregano, ½ tsp Garlic Powder, ½ tsp Onion Powder, ½ tsp Ground Cumin, ½ tsp Liquid Smoke, ¼ tsp Black Pepper, ¼ tsp Rosemary, and 1/8 tsp Ground Cloves. Whisk this together until it’s smooth and then pour over the mushrooms and turn on the heat. Cook the mushroom on medium heat, moving them around occasionally so they all eventually spend time in the sauce. The mushrooms are down when they are reduced in size and most of the sauce has cooked off. Everyone seems to have a favorite Hummus Recipe now so I won’t dwell on this too much….. I make a very easy Hummus consisting of 1 can (15oz) Garbanzo Beans, and 1 can (15oz) White Beans….use the LOW SODIUM or NO SALT ADDED variety whenever you can. Drain the beans and save the juice….. add the beans to your blender with at least 2 Tbs lemon juice, 2-3 cloves garlic, and maybe ¼ to ½ tsp ground cumin. Use a few tablespoons of bean liquid to thin it out if it’s too thick. I don’t really have set amounts …as I just add a little of this – taste, add a little more…… etc. Just be careful if you buy a store brand of Hummus, as it usually contains a LOT of oil and sometimes sodium. I KNOW I’m going to get a lot of questions on the Pitas. 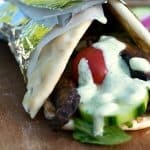 Where do I buy Oil Free Pitas? I don’t know. Really. I don’t. Just like hamburger and hot dog buns – any store bought brand is probably going to have oil. That’s not to say they don’t exist at all….I just don’t know. And I don’t make the trip all the way to Whole Foods every time I cook a new recipe, but if there IS such a creature….Whole Foods is probably where you’d find it. I DO know Ezekiel Brand makes a wrap…so you could always use those. Or…you could make your own….. a bit more work – but guaranteed to be oil-free. 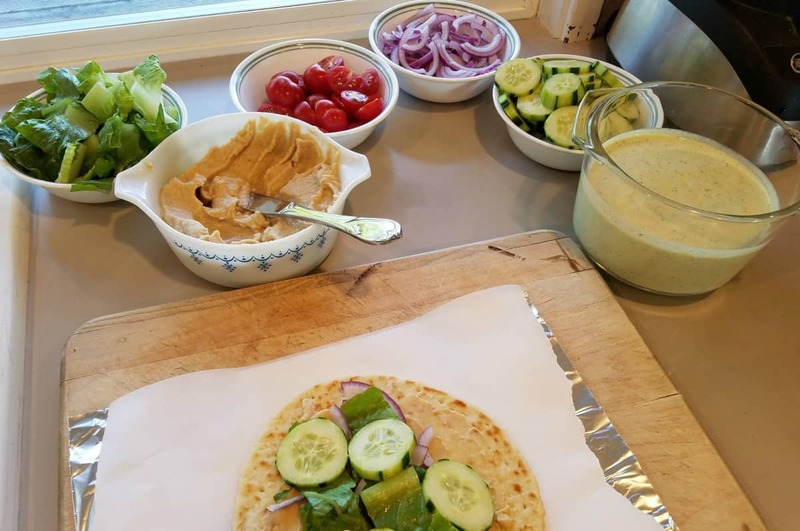 To make the sandwich, take your favorite Pita, (wrap, whatever), and slather a good amount of Hummus right down the middle…..
Now pile on the mushrooms and veggies. I used sliced Red Onion, sliced English Cucumbers, Red Cherry Tomatoes, and Romaine Lettuce. Feel free to add your own favorites. Hope you enjoy and please let me know how you like them in the comments! Ever had Vegan Gyros? However you pronounce it, they're simple to make, SUPER delicious, and you'll be getting your helping of fresh veggies for the day! Drain Tofu and pat dry, slice into smaller cubes and add to blender. Pour into bowl and set in fridge until ready to serve. Place mushrooms in large skillet. Whisk remaining marinade ingredients together in a small cup (bowl) until smooth and pour over mushrooms. Cook mushroom over medium heat until reduced in size and most of marinade has cooked off. Using your favorite Pita (or wrap) spread some of your favorite Hummus down the middle of each Pita and layer on fresh Veggies and Mushrooms. 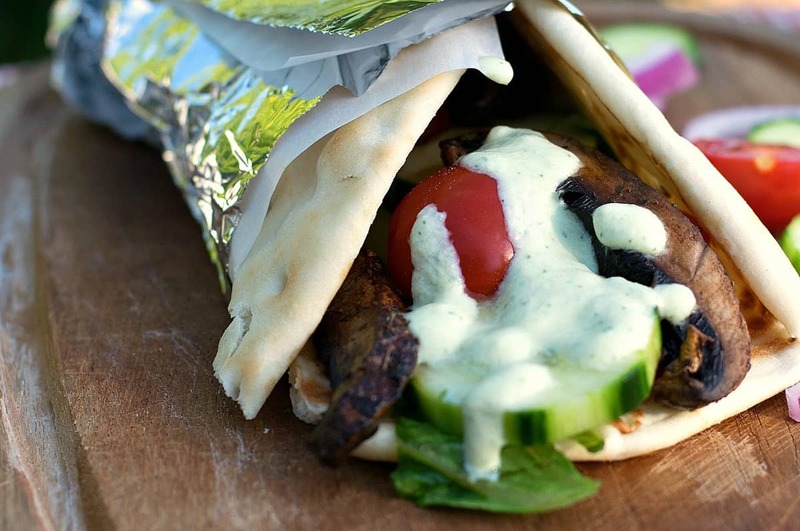 Drizzle with Tzatziki Sauce. Wrap and enjoy! 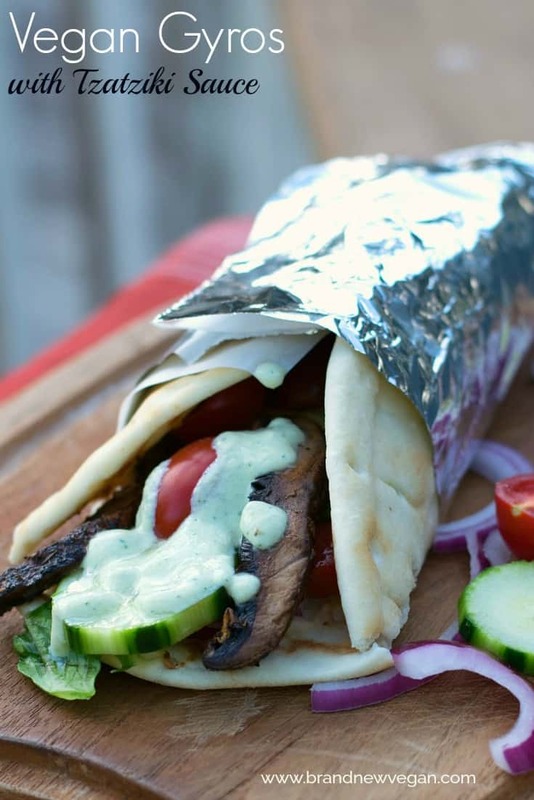 You are right-on with the pronunciation of gyros and tzatziki. I haven’t heard anyone say it correctly since I moved away from the Chicago area. I like your easy recipe for oil-free hummus too. The whole wheat pita I found has no added oil but has plenty of sodium. The brand is Toufayan and I bought it at Kroger. I just love this vegan version-thanks Chuck! Chuck, Thank you for the gyros! I have had some Greek food with my daughter in Vancouver, WA. Since leaving there, I have wondered how I could recreate the taste! I think I have found it!!!!! Thanks again. Sounds like a dinner for this week. Love the Tofu base for the sauce…. Always looking for a lower fat version of any sauce – i.e. remove the cashews – very expensive in both $$ and calories. Thanks again for your wonderful recipes. Sounds delicious, though I am wondering about using extra firm tofu in the tzatziki. Would it not be easier to use silken tofu? I bet it would! Unfortunately my grocery store (my close one anyway) only carries Firm and Extra Firm. Try it – I bet it will be better! Whole foods brand and Trader Joes brand have a fat free pita (Ive only bought the whole wheat). They are great for mini pizza’s too! Can’t wait to try this!! Yum!!! What brand name of tofu do you use? Thank you for the outstanding recipe!. Great idea to blend the cucumber in the sauce. I also added some homemade soy yogurt to the sauce. I often sauté mushrooms with onions, garlic, and soy sauce for my salads, but never thought about eating them like this! So simple and so yummy! Yet another recipe of yours that I LOVE! Have made this several times it’s so good. The sauce makes a lot so I always double the recipe of the mushrooms and marinade so I can use the sauce as leftovers the next day. I’d rate this more stars if I could! for the pita bread. This looks like what’s for lunch in my house tomorrow. Can we have the recipe for this Naan pita bread please? This is the second Brand New Vegan recipe we tried this week. Like the Instant Pot veggie stew, this one is also a home run. We didn’t have onion powder or liquid smoke in the house and the mushrooms still came out delicious. The tzatziki sauce was awesome too. I’m going to use the extra sauce as salad dressing. For those looking for pitas, we used oil-free Ezekiel pitas and they worked well. I am so intrigued, I will try these tonight. One concern: even low sodium soy sauce is loaded, just loaded with sodium. ¼ cup of it is going to be 4-5 times my entire daily allowance. “low sodium” generally only means “compared to the full sodium version” is what I learned, and a compulsive label reader, I saw that a teaspoon of TJ’s low sodium is still a high sodium food, like ½ a day’s worth, if you need to limit sodium to the maximum daily allowance, which is still considered a generous amount by many nutritionists. Just wanted to alert people to really check the sodium content of ¼ cup, it may surprise you. My solution is easy: use less! and leave salt out of the tzatziki as well. It’s me Russ, I overestimated! TJ’s low sodium, ¼ cup (4 TBS) is is 80% of the recommended daily sodium, which for me is 100% of my allowance. But I’m not going to be eating all the mushrooms in one day likely, probably ½.. So yippee, if I watch my other salt that day, and check the pita bread (one TJ’s pita is 14% of the daily limit) it’s a reasonable meal for me! I’ll rate it after I make it, but I’m sure it’s great. I just had these for lunch. I followed the recipe except I used cashews rather than tofu for the tzatziki, and I added a little cilantro as a veggie (I guess I was thinking Mexican rather than Greek–lol). They were delicious, and I would recommend them to anyone–even meat eaters. Thank you Chuck. Can I freeze the sauce? It makes a lot! This tzatziki sauce is phenomenal. I made a big batch and used it in grilled veggie pitas, too. It’s good on anything. I took the seeds out of my cukes and cut some up fine and added to the sauce after it was blended. Great pointers, especially the liquid smoke+maple syrup+soy sauce trinity, very important in vegan cooking for that extra depth in flavor when trying to imitate (grilled) meats! I have been making mine w/ mushrooms (shiitake and portabella) but also with firm tofu, cut into 2mm slices and fried until light brown in sesame oil (which loses its intense aromatic flavor when overheated, and gives the gyro an animal-grease/protein-like texture and flavor). Adding fresh garlic into the pan right at the end adds a lot to the game. Three more things which I find essential in mine, and I didn’t see in your recipe so I can recommend are: finely chopped olives and black raisins slow cooked w/ the mushrooms and tofu. And onions, please onions! Just brown them with everything else. Onion is responsible for so much we like about meat — keep honoring that noble vegetable! Thanks for all the recipes, much love! How long will the tzatziki sauce keep in the refrigerator? Probably 3-5 days. I don’t trust anything after that. What is a possible substitute for mushroom. I like them in small doses. Made these tonight for dinner. I wish you could have seen my DH’s face when I said I was making gyros. That got his attention. They turned out very good. Big thumbs up! I made my sauce with almond milk yogurt and thickened it with oat flour. It worked out just fine. We will definitely put these in the dinner rotation. Thank you for sharing this great recipe. Made these tonight and loved them! Used coco Simons to reduce sodium. My only problem was stopping myself from eating them all! Needed to save some leftovers for lunch tomorrow. And that year-old sauce is a great alternative to ranch for dipping raw veggies. Quoting my husband “Num!” Very satisfying! I had the Tzaktiki cashew sauce on hand already from a Farmer’s Marker, also had the hummus made from another meal, easy peasy! Plus, got my Pita bread at TJ’s Willl be making the full recipe next time, only made half as a test this time. Hey! Wow this recipe is Ah’Mazing! We truly enjoyed the Tzatziki too. The mushroom flavors was really delish. We also made homemade falafel. I will make this again!! Thank you for the recipe. Thanks for another wonderful recipe Chuck!